This is a list of all available modules in HISE. This page is designed as reference guide. For a detailed explanation on how to use them, go to the Backend Manual. If you do so, you are not limited to the listed range, but be careful or you crash the application when used with wild values. All parameters (including integer and boolean data) are internally stored as 32 bit float value for compatibility with host automation. 0 Volume -inf ... -12dB ... 0dB. The volume of the Sound Generator. 1 Balance -100L ... (C) ... 100R The stereo balance of the Sound Generator. 2 Voice Amount 0 ... 64 This is the amount of voices that can be played simultaneously. If all voice slots are used and a new note is triggered, it will kill the oldest note. 3 KillTime Range: 0 ... 20 ms ... 20s If a note must be killed, this is the fade time between the old and the new voice. If you set this to 0 ms, you will hear a click noise. Gain Modulation All Modulators (Except Container & Synthesizer Groups) Modulates the volume of each voice of the sound generator. By default, it uses linear gain scaling (0.5 = -6dB), so you might want to change the value curve. A simple and lightweight sine wave generator. It can be used to drive a FM Synthesiser, or stacked together for Additive Synthesis or used as simple enhancement of another sound. Musical - in octaves / semitones. It also has a internal Wave-Shaper effect, that allows to quickly add some harmonics to dirten up the sound. 4 Octave -5 ... 0 ... 5 If the mode is set to Musical, this defines the coarse frequency. 5 Semitones -12 ... 0 ... 12 If the mode is set to Musical, this defines the fine frequency in semitones. 6 Use Frequency Ratio On ... Off Toggles between the two modes for the pitch definition. 7 Coarse Ratio 1 ... 12 If the mode is set to Harmonics, this defines the harmonic index (1 being the root frequency). 8 Fine Ratio 0.0 ... 1.0 If the mode is set to Harmonics, this defines the fine frequency (as factor). 9 Saturation Range: 0% ... 100% The saturation amount for the internal wave shaper. Use this to quickly add some harmonics. If you change one of the frequency parameters, the pitch will be updated at the next note on, so for realtime modulation of the pitch, use the Modulator chain Pitch Modulation. The Waveform Generator is a basic synthesizer module with two oscillators and the most popular waveforms: Sine, Triangle, Saw, Square, Noise. The sine and triangle waves are computed cheaply and naive, and the Saw and the Square use some advanced anti aliasing (BLIT). The balance between the two oscillators (=the Mix) can be fully modulated. This is the module of choice for subtractive synthesis. 4 Octave Transpose 1 -5 ... 0 ... 5 The octave transpose factor for the first Oscillator. 6 Detune 1 -100ct ... 0.0ct ... 100ct The pitch detune of the first oscillator in cent (100 cent = 1 semitone). A simple white noise generator. It has no additional parameters (it simply generated white noise). White Noise is loud, so be careful! This is a wavetable synthesiser with a hardcoded clarinet wavetable. (only for internal use). This is a basic audio file player which supports looping & pitch tracking. 4 PreloadSize -1 ... 11000 ... The preload size in samples for all samples that are loaded into the sampler. If the preload size is -1, then the whole sample will be loaded into memory. 6 VoiceAmount 0 ... 64 The amount of voices that the sampler can play. This is not the same as voice limit. 7 RRGroupAmount 0 ... x The number of groups that are cycled in a round robin manier. 8 SamplerRepeatMode Kill Note, Note off, Do nothing determines how the sampler treats repeated notes. 9 PitchTracking On, Off Enables pitch ratio modification for different notes than the root note. Disable this for drum samples. 10 OneShot On, Off plays the whole sample (ignores the note off) if set to enabled. 12 Purged On, Off If this is true, all samples of this sampler won't be loaded into memory. Turning this on will load them. 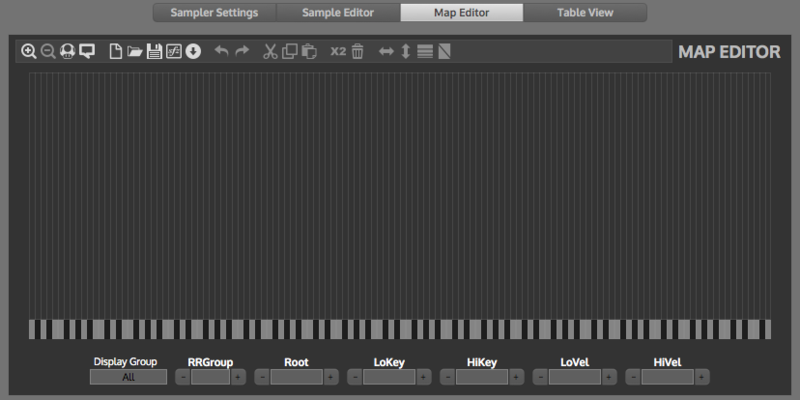 As the name suggests it acts as a container for other sound generators (think of it as a folder in a file structure). Containers process all child sound generators independently but have some limitations (no pitch modulation, no modulators that process MIDI messages) which are neccessary to achieve this. Every HISE patch starts with a container that can be filled with other sound generators. All patch settings (the interface, the macro controls, the views) are saved within the root container object. Renders its voice as sum of all child synth voices (and enabling some neat features like FM synthesis). This can be used to build eg. additive synthesis generators while saving CPU power (because every otherwise every harmonic sine wave would be a own synthesiser. And you can use all modulators, so can simply drop an envelope on the Synthesiser Group and it will be applied to all child synths. Midi Processors allow to process incoming MIDI messages and create a customized behaviour of the virtual instrument. Instead of having a global MIDI processor, each Sound Generator has their own MIDI Processor slot so you can define different behaviour for different synths - or by using the MIDI Processor slot of the parent Container define the behaviour for all child synths. This allows to keep the tasks of every MIDI Processor quite simple. This modulator uses the MIDI velocity to calculate its output. 0 Inverted On, Off if true, then the modulator works inverted, so that high velocity values are damped. 1 UseTable On, Off if true then a look up table is used to calculate the value. You can see the input velocity in the Table. It uses a linear range, so you might want to change the table (like the screenshot) to a more exponential one. The Array modulator is a note number to value array. For itself, it has a limited usage but combined with scripting, it can be used to set values quite elegantly. The Modulator has five states: Attack, Hold, Decay, Sustain and Release and allows modulation of the attack time and level, the decay time and the release time with VoiceStartModulators. Unlike the SimpleEnvelope, this envelope has a exponential curve, so it sounds nicer (but is a little bit more resource-hungry). This modulator is the most simple envelope: it has an attack and release time. The attack time can be modulated. This envelope can use either linear ramping or an exponential curve. Since we perceive loudness logarithmically, it is recommended to use the exponential mode for the gain modulation (if the envelope is used as musical sound shaper. For pure technical tasks (removing clicks), the linear ramping should be sufficient. 2 Linear Mode If true, the envelope uses a linear ramp or an exponential curve if false. This documentation is hosted on GitHub. If you find an error, feel free to open an issue or file a pull request.